The Ariane 5 for Flight VA239 rides atop a mobile launch table during its transfer from the Spaceport’s Launcher Integration Building to the Final Assembly Building. 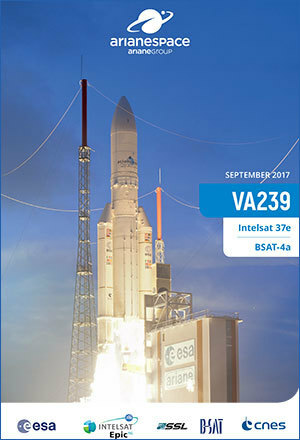 The Ariane 5 for Arianespace’s ninth flight in 2017 is being readied for a September 5 liftoff from the Spaceport, while its two satellite passengers – Intelsat’s Intelsat 37e and BSAT-4a for SSL on behalf of Japan’s Broadcasting Satellite System Corporation (B-SAT) – continue their final checkout at the French Guiana facility. Following its build-up in the Launcher Integration Building, the Ariane 5 has been moved to the Final Assembly Building for the upcoming installation of Intelsat 37e and BSAT-4a – which are now undergoing their own checkout processes in separate halls of the Spaceport’s S5 payload preparation facility. The upcoming mission to geostationary transfer orbit is designated Flight VA239 in Arianespace’s numbering system, and will mark the 239th launch of an Ariane vehicle since the European launcher series entered service in 1979. The heavy-lift Ariane 5 is operated as part of Arianespace’s launcher family at the Spaceport, which also includes the medium-lift Soyuz and lightweight Vega. Built by Boeing using a 702MP spacecraft platform, Intelsat 37e is the next satellite in Intelsat’s high-throughput EpicNG series for launch. 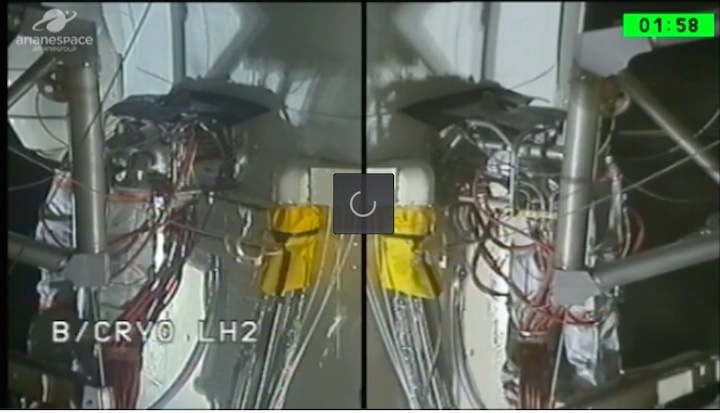 Preparations for Flight VA239’s two satellite passengers included the fit-check of Intelsat 37e with its payload adapter (at left), and fueling of BSAT-4a (photo at right). It also will be the fourth EpicNGspacecraft orbited by Arianespace to date (following Ariane 5 missions with Intelsat 29e and Intelsat 33e in January and August 2016, respectively, plus last February’s heavy-lift flight that lofted SKY Brasil-1/Intelsat 32e). Operating in the C, Ku and Ka frequency bands, the spacecraft will provide capacity for wireless backhaul, enterprise VSAT and mobility networks. Intelsat 37e, which is to carry out its mission from a 342-deg. East orbital slot, will weigh approximately 6,440 kg. at liftoff. 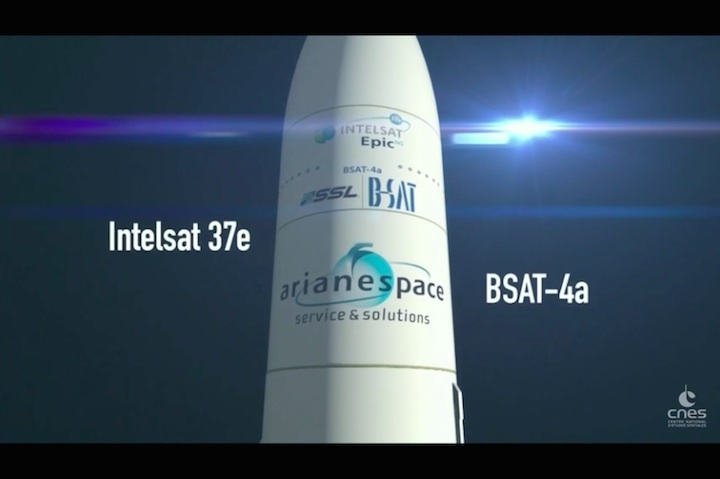 Arianespace is launching Flight VA239’s co-passenger, BSAT-4a, as part of a turnkey contract between B-SAT and U.S.-based satellite manufacturer SSL. To be operated from an orbital position of 110 deg. East, this spacecraft will be used for Direct-To-Home (DTH) television relay in Japan and to expand the availability of advanced television services – such as 4K/8K ultra-high definition TV. BSAT-4a is based on the SSL 1300 satellite platform and is fitted with 24 Ku-band transponders. It will weigh approximately 3,520 kg. at liftoff, with a design life that exceeds 15 years. Arianespace has a 30-year-plus track record serving operators in the Japanese market – including B-SAT, for which it is the launch services provider of choice. Flight VA239 will continue Arianespace’s busy schedule in 2017, in which eight launches were performed during the year’s first seven months, utilizing the company’s full launcher family (two with Vega; two with Soyuz; and four using Ariane 5). The completion of Ariane 5’s assembly for Flight VA239 is shown during activity in the Spaceport’s Final Assembly Building. At left, BSAT-4a is positioned atop the launcher, followed by the installation of Intelsat 37e (center and right), which is encapsulated in a long version of Ariane 5’s payload fairing. 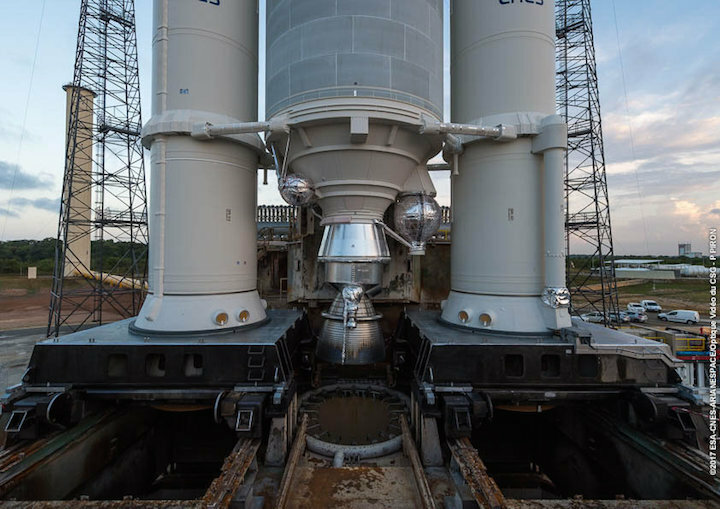 The Ariane 5 for Arianespace’s ninth mission of 2017 is now fully assembled following integration of its two satellite passengers at the Spaceport in French Guiana. During activity in Ariane 5’s Final Assembly Building, the upper payload component – containing Intelsat 37e, mounted on its SYLDA dispenser system and protected by an ogive-shaped fairing – was lowered into position over BSAT-4a, which previously was installed atop the launcher’s central core. 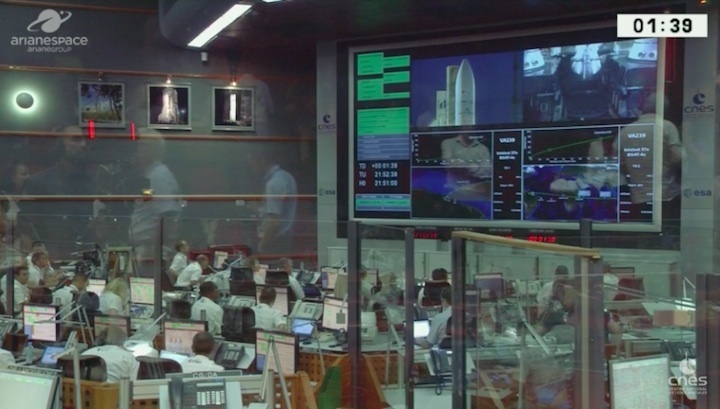 This step clears the way for final checkout, which will enable the launch readiness review to be conducted on September 1, followed by Ariane 5’s rollout to the Spaceport’s ELA-3 launch zone the following Monday, and an evening liftoff on Tuesday, September 5. 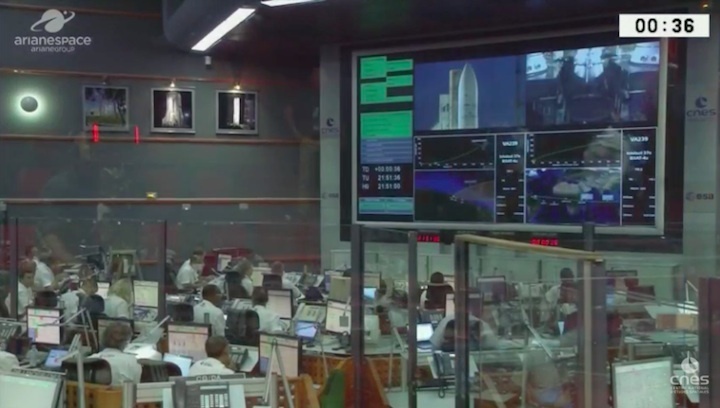 The upcoming mission is designated Flight VA239 in Arianespace’s numbering system, and it will deliver the two telecommunications payloads into geostationary transfer orbit. To be deployed first during the 47-minute flight sequence is Intelsat 37e – the next satellite in Intelsat’s high-throughput EpicNG series for launch, which was built by Boeing using a 702MP spacecraft platform. This spacecraft will operate in C, Ku and Ka frequency bands, providing capacity for wireless backhaul, enterprise VSAT and mobility networks from a 342-deg. East orbital slot. Intelsat 37e has an estimated liftoff mass of 6,438 kg. Ariane 5’s second passenger – BSAT-4a, which is being launched as part of a turnkey contract between Japan’s Broadcasting Satellite System Corporation (B-SAT) and U.S.-based satellite manufacturer SSL – will be operated from an orbital position of 110 deg. East. It will be used for Direct-To-Home (DTH) television relay in Japan, as well as to expand the availability of advanced television services (such as 4K/8K ultra-high definition TV). BSAT-4a will weight approximately 3,520 kg. at liftoff. 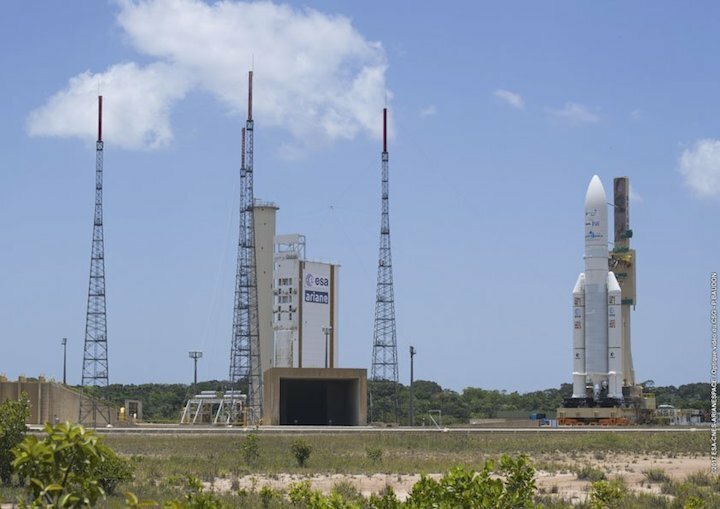 Arianespace’s fifth Ariane 5 mission of 2017 has been given the “green light” for liftoff on September 5 following today’s successful launch readiness review, which was conducted at the Spaceport in French Guiana. 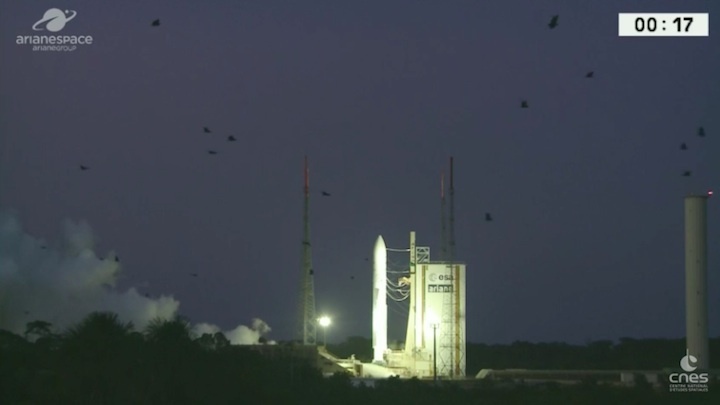 This milestone – held prior to each Arianespace flight – confirmed that the heavy-lift vehicle and its dual-satellite payload of Intelsat 37e and BSAT-4a are ready for launch, as well as the Spaceport’s infrastructure and the network of downrange tracking stations. With approval granted, Ariane 5 is cleared for its September 4 rollout from the Final Assembly Building to the ELA-3 launch zone. 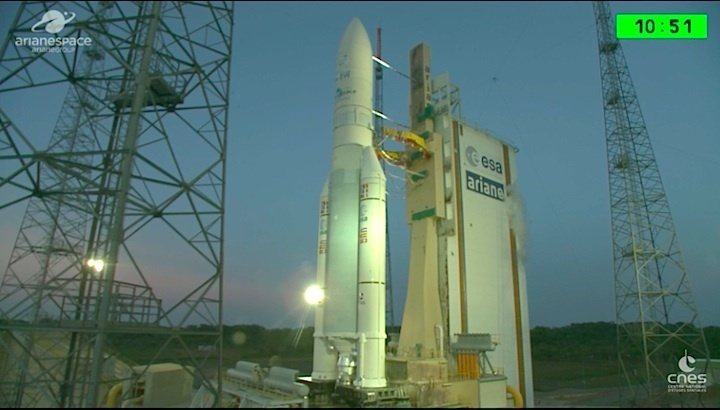 Liftoff will occur the following day during a 33-minute launch window that opens at 6:51 p.m. local time in French Guiana. Total payload lift performance for next week’s liftoff is approximately 10,838 kg., with the Intelsat 37e and BSAT-4a satellites being deployed to geostationary transfer orbit during a flight lasting 47 minutes. 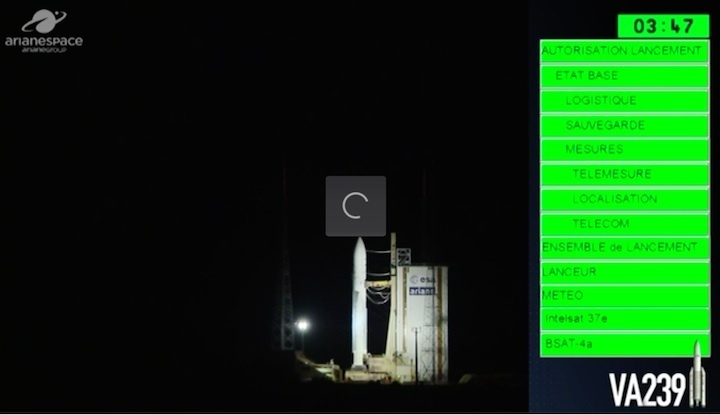 The mission is designated Flight VA239 in Arianespace’s launcher family numbering system, signifying the 239th with an Ariane family vehicle. Positioned in Ariane 5’s upper passenger position and encapsulated by the launcher’s ogive-shaped payload fairing, Intelsat 37e – produced by Boeing – is the next satellite in Intelsat’s high-throughput EpicNG series for launch. Weighing an estimated 6,440 kg. at liftoff, the spacecraft will provide capacity for wireless backhaul, enterprise VSAT and mobility networks, carrying out its mission from a 342-deg. East orbital slot. BSAT-4a – Flight VA239’s lower passenger, contained in Ariane 5’s SYLDA dispenser system – is being launched by Arianespace as part of a turnkey contract between Japan’s Broadcasting Satellite System Corporation (B-SAT) and U.S.-based satellite manufacturer SSL. To be operated from an orbital position of 110 deg. East, this spacecraft will be used for Direct-To-Home (DTH) television relay in Japan, as well as to expand the availability of advanced television services (such as 4K/8K ultra-high definition TV). BSAT-4a will weight approximately 3,520 kg. at liftoff. The Ariane 5 launcher for Arianespace Flight VA239 – outfitted with the Intelsat 37e and BSAT-4a satellite passengers – approaches its launch zone at the Spaceport in French Guiana. 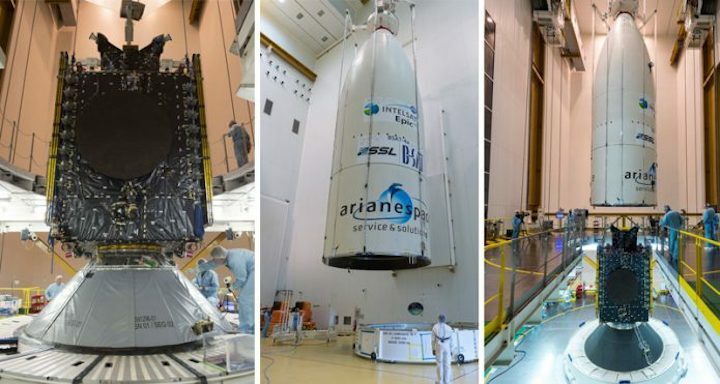 Arianespace has delivered another Ariane 5 to the launch zone at Europe’s Spaceport in French Guiana, positioning the heavy-lift vehicle for its September 5 flight with two telecommunications satellites: Intelsat 37e and BSAT-4a. 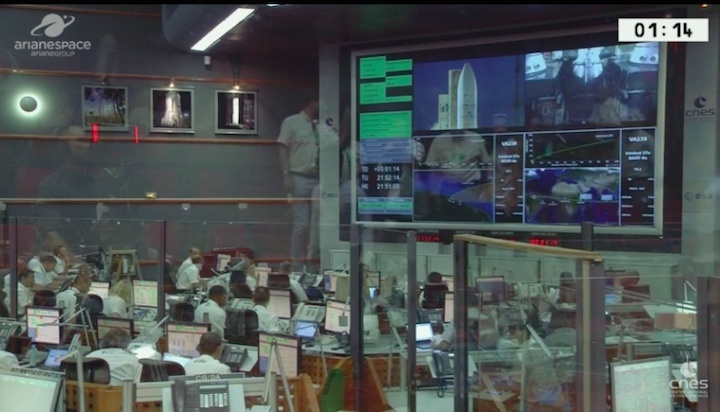 Riding atop a mobile launch table, Ariane 5 was transferred to the ELA-3 launch zone from the Spaceport’s Final Assembly Building – where its two passengers had been integrated as part of pre-flight preparations. With the rollout now completed, the final countdown will begin for a liftoff tomorrow at the start of a 33-min. 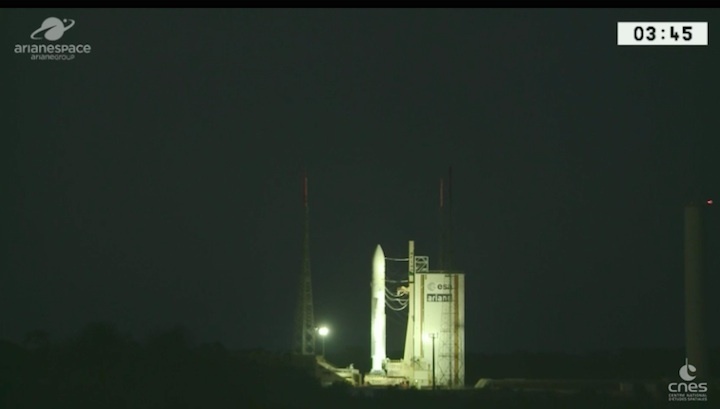 launch window that opens at 6:51 p.m. local time in French Guiana. 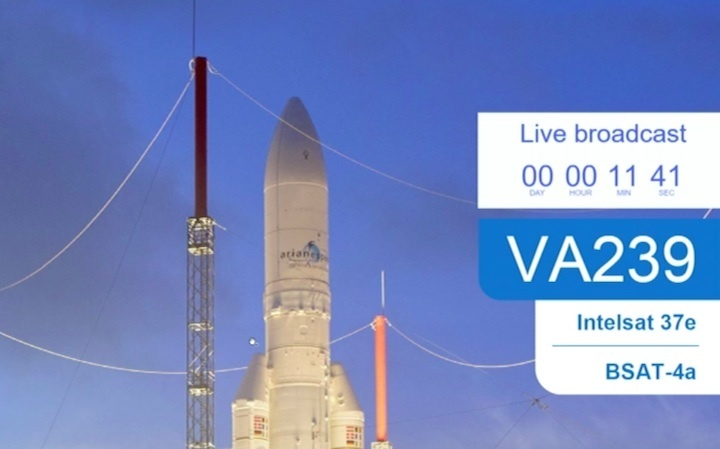 For this 239th launch of an Ariane-series vehicle – designated Flight VA239 in Arianespace’s numbering system – the payload lift performance to geostationary transfer orbit is an estimated 10,838 kg. The total factors in the mass of Intelsat 37e and BSAT-4a, plus the launch vehicle’s dual-passenger dispenser system and satellite integration hardware. 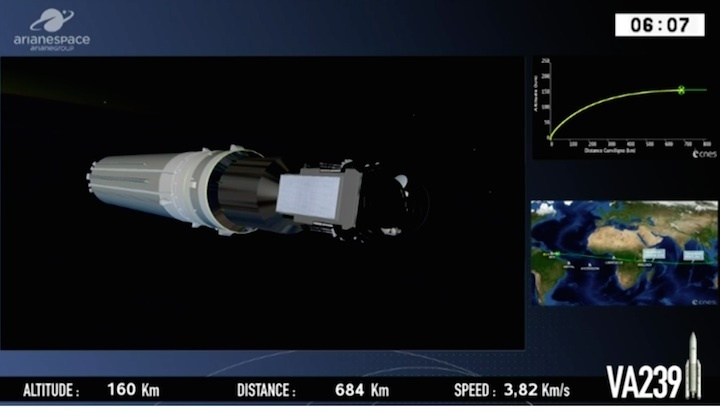 Intelsat 37e is riding as the upper passenger in Ariane 5’s payload arrangement, to be released 29 minutes into tomorrow’s mission. The spacecraft, with a liftoff mass estimated at 6,438 kg., was built for Intelsat by Boeing using a 702MP platform, and will operate from an orbital position of 342 deg. East. BSAT-4a – whose launch is part of a turnkey contract between Japan’s Broadcasting Satellite System Corporation (B-SAT) and U.S.-based manufacturer SSL – will be deployed from Ariane 5’s lower passenger position. 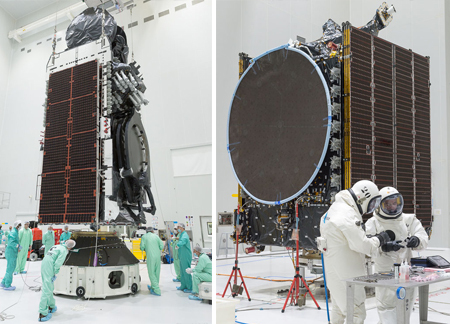 Based on the SSL 1300 platform, this satellite’s separation will occur 47 minutes after liftoff – completing Arianespace’s September 5 mission. BSAT-4a has an estimated liftoff mass of 3,520 kg. and will operate from a 110 deg. East orbital slot. 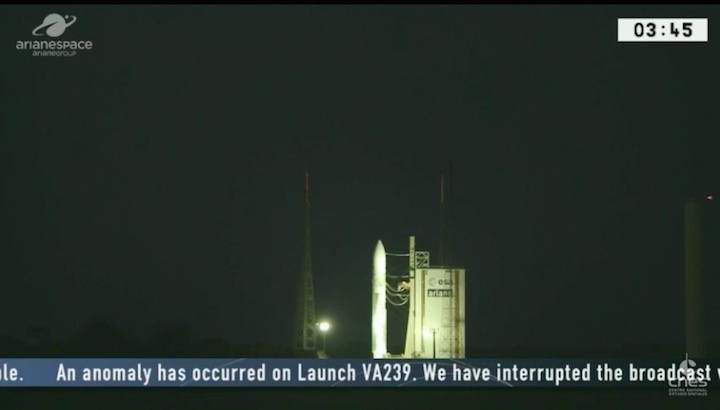 During the final seconds of the launch countdown for Arianespace Flight VA239, the checkout process detected an anomaly on the launcher as the Vulcain cryogenic main stage engine was being ignited. As a result, the final countdown was interrupted. 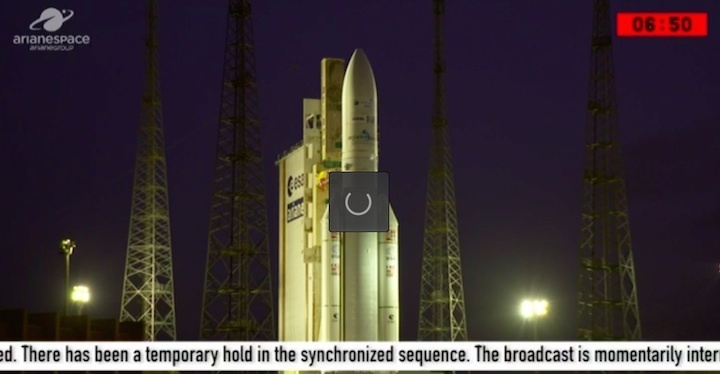 The Ariane 5 and its Intelsat 37e and BSAT-4a payloads immediately switched to a safe mode. Analysis of data is underway to determine the cause of the anomaly. In parallel, the launcher will be transferred back to the Final Assembly Building at the Spaceport in French Guiana – where it is to be returned to a flight-ready condition. 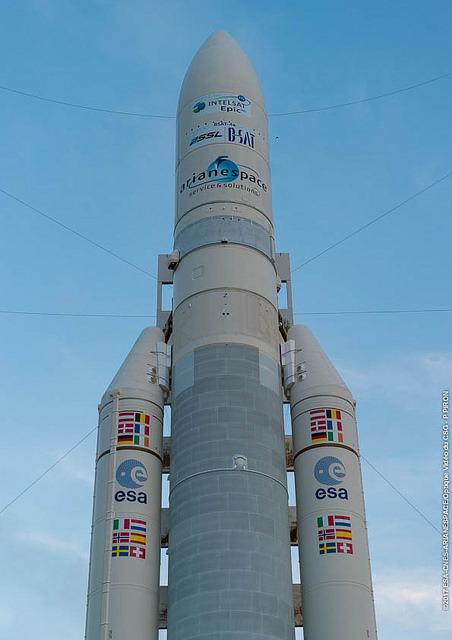 Arianespace will set a new launch date as soon as possible. 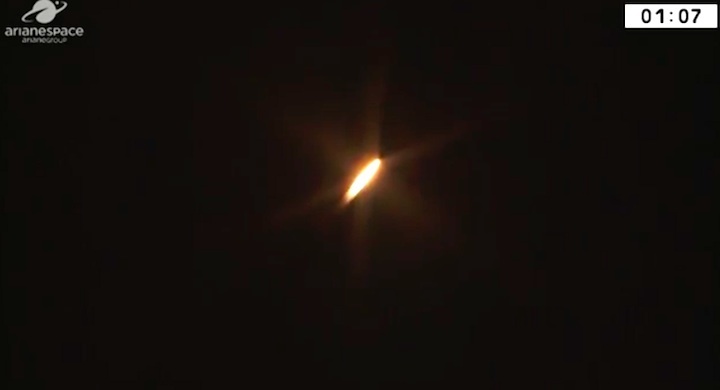 Arianespace orbited telecommunications satellites for long-time customers on today’s successful mission – confirming the company’s role as a launch services leader in terms of availability, reliability and performance. 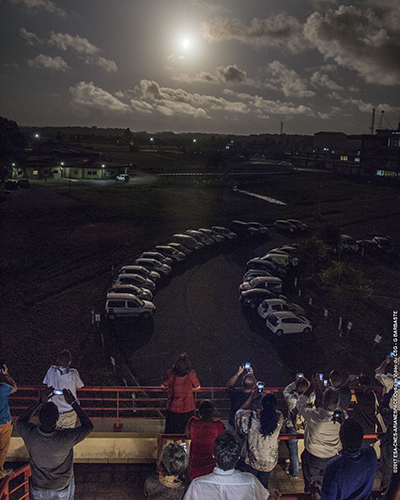 Conducted from the Spaceport’s ELA-3 launch zone in French Guiana, the successful mission delivered an estimated payload lift performance of 10,838 kg. to geostationary transfer orbit (GTO) – utilizing the heavy-lift Ariane 5 member of Arianespace’s launcher family, which also includes the medium Soyuz and lightweight Vega. Designated Flight VA239, the mission carried Intelsat 37e for global operator Intelsat; along with BSAT-4a, which was launched as part of a turnkey contract between Japan’s Broadcasting Satellite System Corporation (B-SAT) and U.S.-based satellite manufacturer SSL. 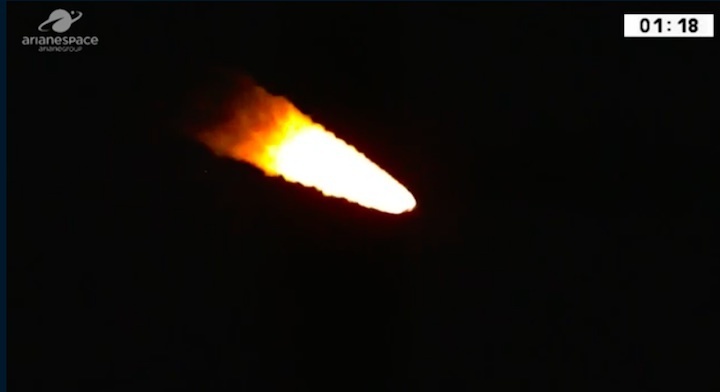 Intelsat 37e was deployed first in the flight sequence, separating from Ariane 5 at 29 minutes after liftoff, followed approximately 18 minutes later by BSAT-4a. Intelsat 37e – built by Boeing using a 702MP platform – is the latest satellite from Intelsat’s high-throughput EpicNG series to be launched. 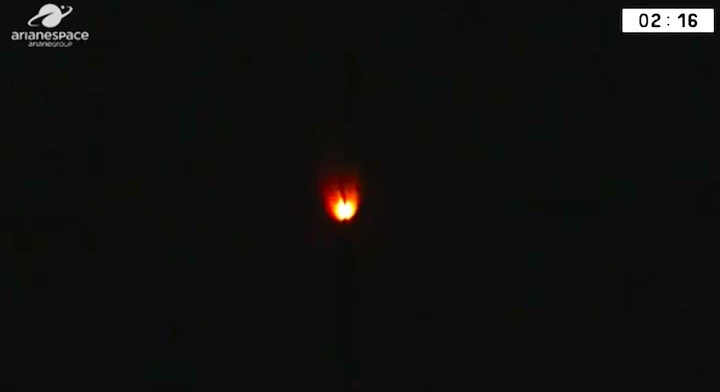 It also marks the fourth EpicNG spacecraft orbited by Arianespace to date (following Ariane 5 missions with Intelsat 29e and Intelsat 33e in January and August 2016, respectively, plus last February’s heavy-lift flight that lofted SKY Brasil-1/Intelsat 32e). Overall, Intelsat 37e is the 59th Intelsat satellite launched by Arianespace since 1983, as well as the 55th Boeing-produced spacecraft orbited by the company – continuing a partnership that extends back to 1987. Arianespace’s order book includes three more satellites to be lofted for Intelsat. Two Boeing payloads are in the Arianespace order book for future missions: Horizon-3e and ViaSat 3F1. Weighing an estimated 6,440 kg. at liftoff, Intelsat 37e will provide capacity for wireless backhaul, enterprise VSAT and mobility networks, carrying out its mission from a 342-deg. East orbital slot. 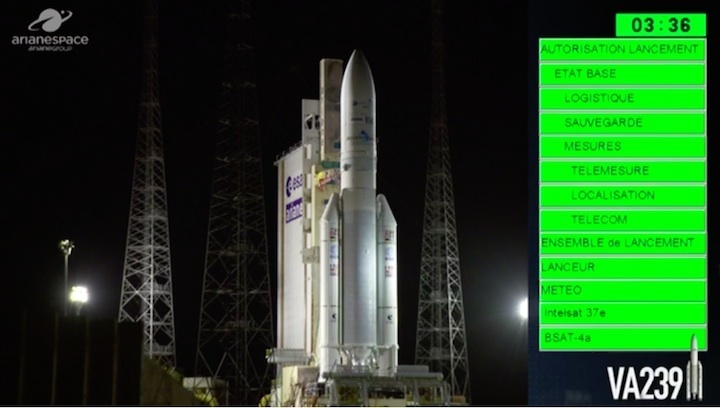 The second-released passenger on today’s successful Ariane 5 flight, BSAT-4a, will be used for Direct-To-Home (DTH) television relay in Japan, as well as to expand the availability of advanced television services (such as 4K/8K ultra-high definition TV). 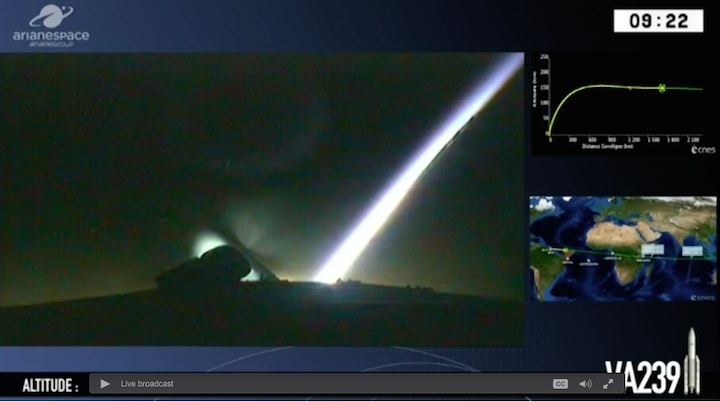 It will operate from a final orbital position of 110 deg. East. 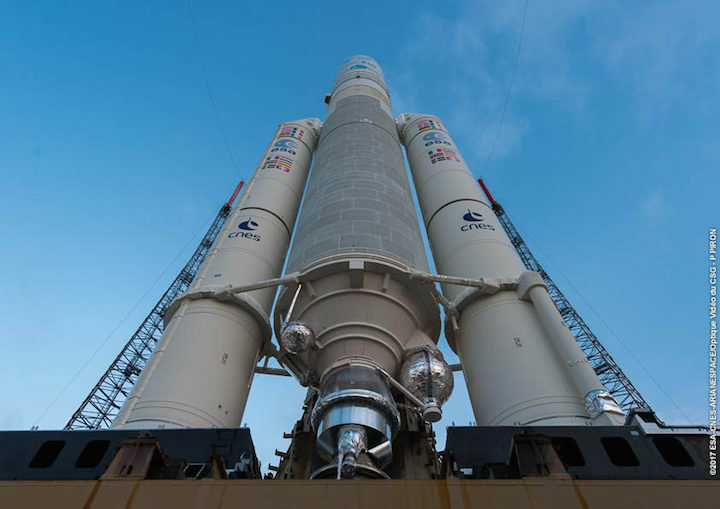 Arianespace has launched all B-SAT satellites since this company’s creation, reflecting an unmatched position in the market. Since 1989, Arianespace has lofted a total of 29 GTO satellites for Japanese operators, representing more than 75 percent of the Geostationary Earth Orbit (GEO) market share in Japan. 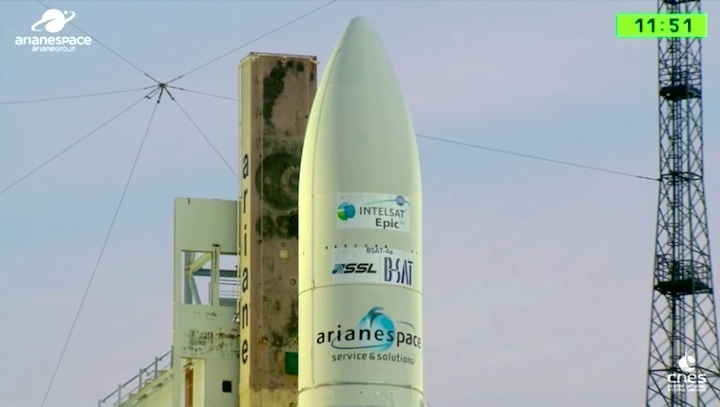 Arianespace’s launch of BSAT-4a also continues its long-running partnership with SSL, having now launched a total of 64 satellites produced by this manufacturer since 1983 – with three more in the company’s order book (Azerspace2/Intelsat-38, Eutelsat 7C, and Intelsat 39). 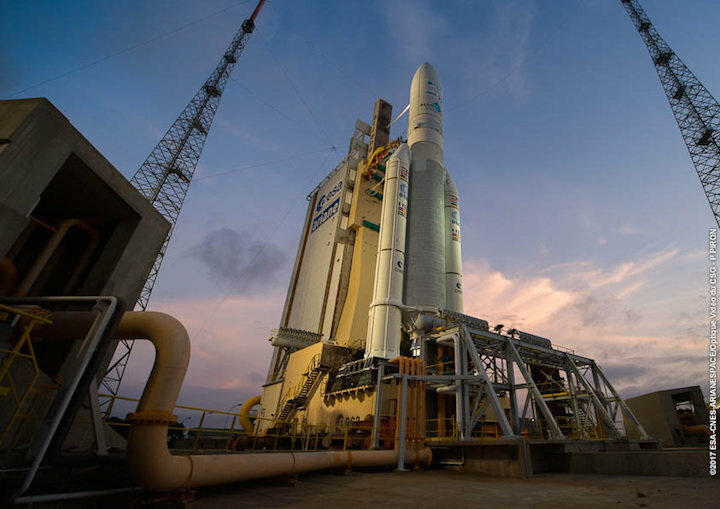 Flight VA239 was Arianespace’s ninth launch in 2017, and it follows other heavy-lift Ariane 5 missions performed this year on February 14 (carrying SKY Brasil-1 and Telkom 3S), May 4 (SGDC and KOREASAT-7), June 1 (ViaSat-2 and EUTELSAT 172B) and June 28 (Hellas Sat 3-Inmarsat S EAN and GSAT-17). 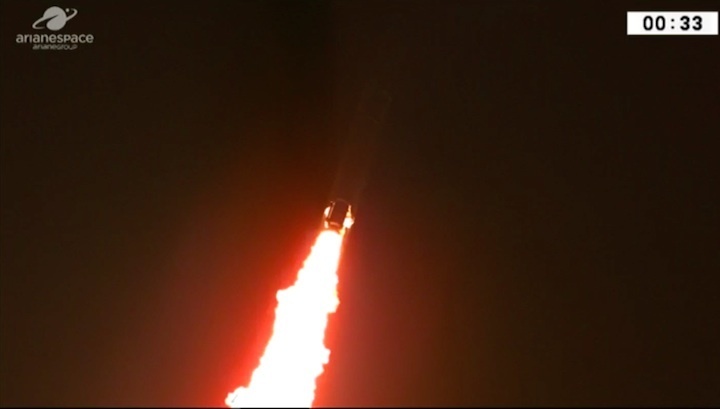 Also conducted earlier in 2017 were Arianespace’s medium-lift Soyuz missions on January 27 (with Hispasat 36W-1) and May 18 (SES-15); plus light-lift Vega flights performed March 6 (Sentinel-2B) and August 1 (OPTSAT-3000 and Venµs). 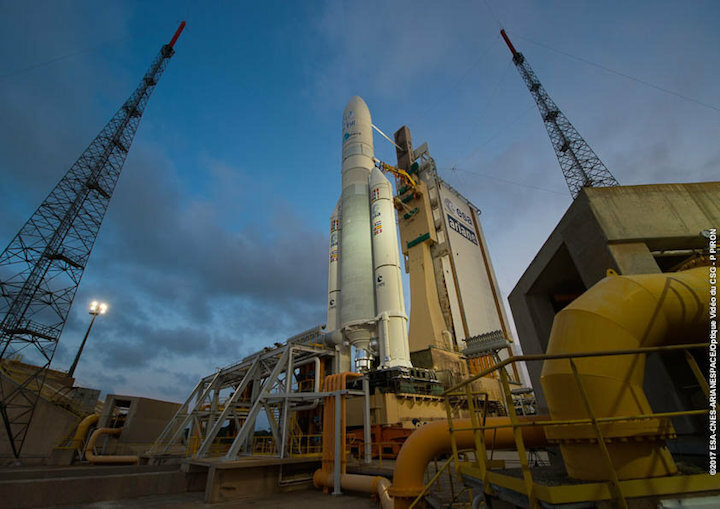 Arianespace’s next mission – a Vega flight at the service of Thales Alenia Space – is planned for November 7.